On Friday evening W.A.G.E. presented the results of its 2010 survey of payments received by artists who exhibited with nonprofit art institutions in New York City between 2005 and 2010. The survey found that 58% of artists who responded received “no form of payment.” The audience, including Artists Space director Stefan Kalmár, asked questions critical of the survey methodology, but did not refute the group’s findings. W.A.G.E. has partnered with Artists Space to explore the development of a self-regulatory model, mandating the implementation of a fee schedule within the institution. Presenter A.K. Burns explained one of the rationales for artists fees, “nonprofits get money from different sources for public education, and the artist is the educator. We are wondering why the artist isn’t being paid?” That artists should be remunerated for their cultural value in capital value is one of W.A.G.E.’s positions from its statement and one that remains controversial. 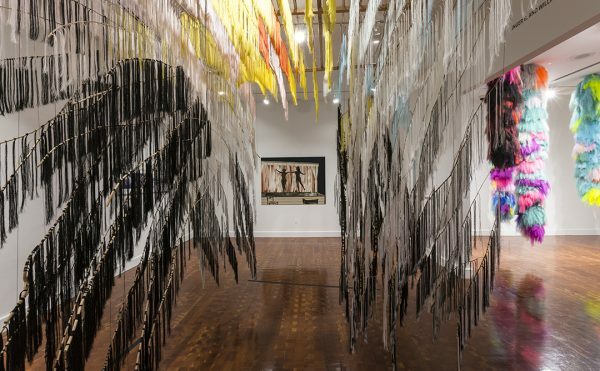 The general counter-arguments include the belief that artists will eventually be paid through the sales of the work in the commercial market and that nonprofits do not have the budgets to pay artists. W.A.G.E. rejects the positioning of the artist as speculator and seeks to address the agreements between nonprofits and artists regarding fees with their certification program. A.L. Steiner argued that the market has its own economy and W.A.G.E. is not currently addressing the speculative remuneration that occurs after an exhibition. In regards to budgets Artists Space provided samples at W.A.G.E’s insistence from 2005 to the present for comparison to the Canadian CARFAC fee schedule, which is also the same time frame of the W.A.G.E survey. The budgets revealed Artists Space has used varying amounts of its budget for paying artists with a renewed emphasis on funding production and artists fees under Kalmár’s direction effectively demonstrating that nonprofits do have funds to meet the variable CARFAC schedule which never would have exceeded 4% of any of the budget samples presented. Still, in one fiscal year before Kalmár’s tenure, artists’ compensation was only 0.3% of Artists Space’s budget. This inconsistency is one of the things that both Artists Space and W.A.G.E are working to address with the certification program. 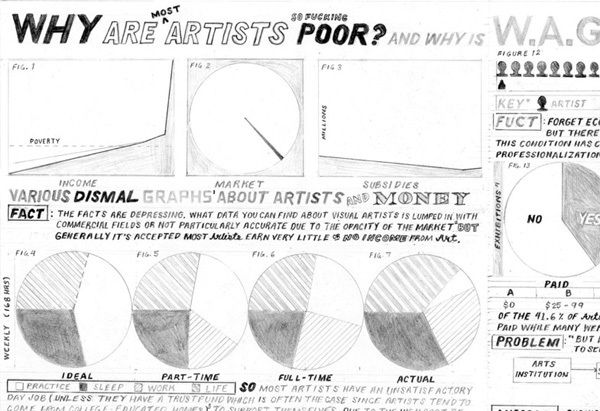 The data shows that artists are as likely to be paid over $5,000 as they are $0 for a solo exhibition. It seems, as Artists Space’s detailed budgets for two recent exhibitions showed, that funding is an institutional and artistic question of priority. One artist represented in a sample budget asked for their fee to be added to the production of their work, which raised the larger issue of what constitutes the difference between paying for the artists’ work and paying them for their role as an educator or their labor in general. According to W.A.G.E member Lise Soskolne who presented the Artists Space/CARFAC fee schedule comparison, each sample budget represents 5% of Artists Space total operational budget. In case, you were wondering, I’m not a reporter, and I have a particular bias against our highly stratified market system. 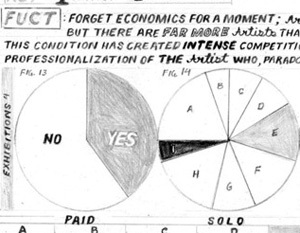 To this end, I made a drawing for W.A.G.E.’s survey release that less subtly makes a connection between the promise of being paid by the market and the lack of consistent pay by arts institutions. While the market certainly works for some artists to different degrees, including myself, it is also a system where very few artists are paid incredibly high prices and most artists profit very little from their practice, if they are able to sell anything at all. There’s currently little data to support this assertion despite a multi-billion dollar arts economy where some people profit greatly from artist’s work, but that’s also part of the reason I made my drawing in relation to W.A.G.E.’s survey. It’s an area I hope they will address, but as they made clear to the audience, their first survey took an enormous amount of time an effort and still could be improved, all without being paid anything, which I’m sure most artists can relate to. 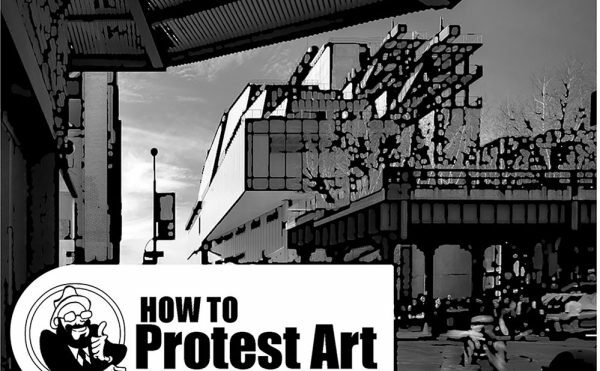 Activism and art are often internally motivated and done out of passion, not the expectation of getting rich, but that is not the same as being paid something. W.A.G.E. is not asking for society to pay all artists or the government to provide subsidies. 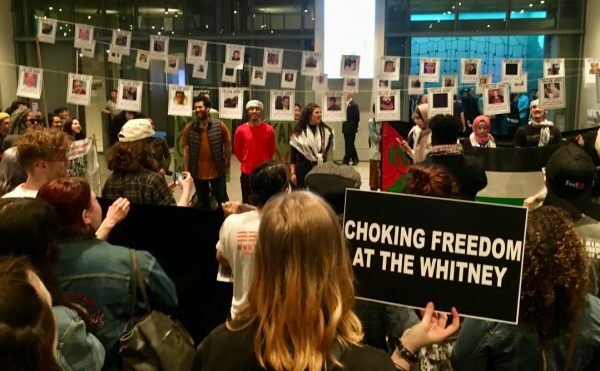 The group is asking for exhibiting artists to be paid for their role in educating the public through artistic practices, or in their words to “make the world more interesting,” in the specific context of nonprofit arts institutions. Later in the evening on Friday I discussed the survey data with a nonprofit director who noted that some private foundations make artists fees a priority in their grant funding applications, so the audience for W.A.G.E isn’t just arts institutions but their funders as well. Soskolne also addressed this in the panel after an audience member asked about how the certification would be enforced. Soskolne explained that bulk of funding for nonprofits comes from private foundations that can’t be regulated by the state making self-regulatory guidelines even more important. I’m interested in what W.A.G.E is doing because it’s a specific approach to addressing problems of equity for cultural work in our market-based economy. They are partnering with a respected arts organization that was founded by NYSCA to figure out ways to help artists. Kalmár and his staff demonstrated that Artists Space is committed to doing just that and that commitment can send a powerful message to other arts institutions. It’s what’s simply called leading by example. 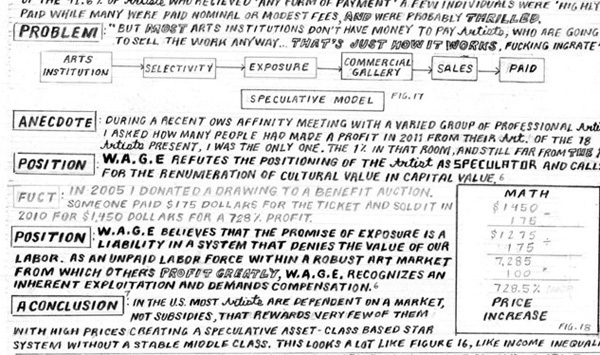 Will this solve the broader inequity in the art market? No. It’s a start. W.A.G.E. is collecting data, starting a dialogue and working with both the public and arts institutions to address a larger problem that is too often met with resignation, “That’s just how it works.” It doesn’t have to and W.A.G.E. is doing something about it, and they are looking for your input at the next discussion.